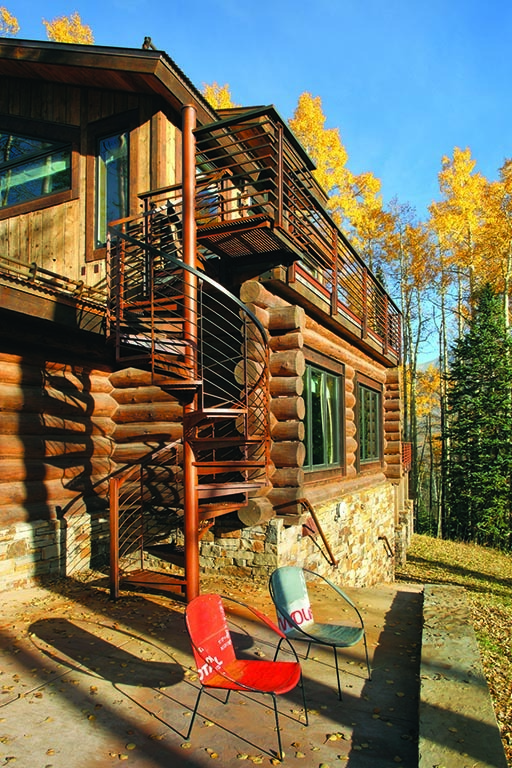 When Jeff Moody stumbled upon a “tired, old log cabin” for sale in Telluride’s Mountain Village, he knew it had the makings of a uniquely modern vacation home for his Toronto-based family. Built in 1980, it was one of the only two original log cabins in this enclave. But it had pristine views and spectacular ski-on access located 50 yards from the front door for this ski family. With a fast-paced lifestyle as an executive at a boutique wealth-management firm, Moody savors his time off in the mountains. And, after making the rounds vacationing with his family at the West’s best ski towns, Telluride became the clear favorite. “It’s a very special place,” Moody says. “We love that the locals and the visitors all get along there. It’s not about ‘What do you do?’ It’s about ‘What did you do today?’” Which is exactly why the Moodys chose Telluride when they decided to set up a more permanent vacation stop. “When I decided to buy something I told the real estate agent to send me everything that no one was interested in,’” says Moody, who was focused on finding a property to remodel into a vacation home that suited his family’s style — and lifestyle. 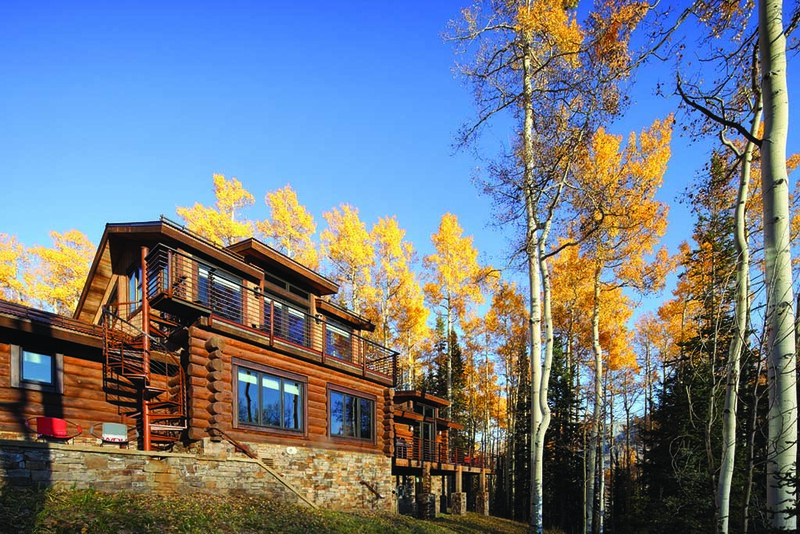 When they purchased the cabin, the Moodys had also received an architect’s remodel plans for the home. But, when Moody flew into Telluride to look at the plans, he knew they were not heading in the right direction. He then started interviewing architects. “One of our goals was to bring the outside in, see all the views — and when it’s snowing, be a part of the mountains,” Moody says. Photos by Nico Marques. 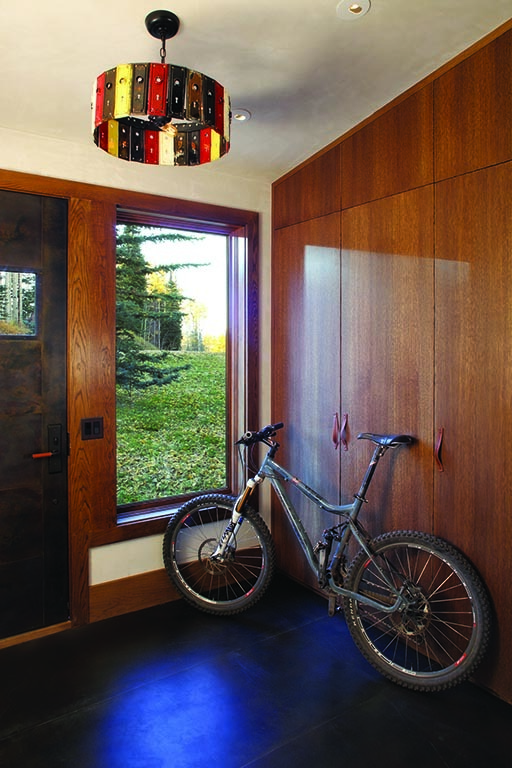 “The house was a real little, simple, single-gable roof structure with logs,” says architect Luke Trujillo, owner of Telluride-based TruLinea Architects. “I remember pulling up to the driveway and thinking ‘Oh, my. Am I really going to interview for this job?’ But it was serendipitous, and I got a client that became a friend.” In fact, Trujillo and Moody recently returned from a motorcycle tour of the Italian Dolomites on Ducatis. The master bedroom. Photos by Nico Marques. And the accompanying bath. Photos by Nico Marques. 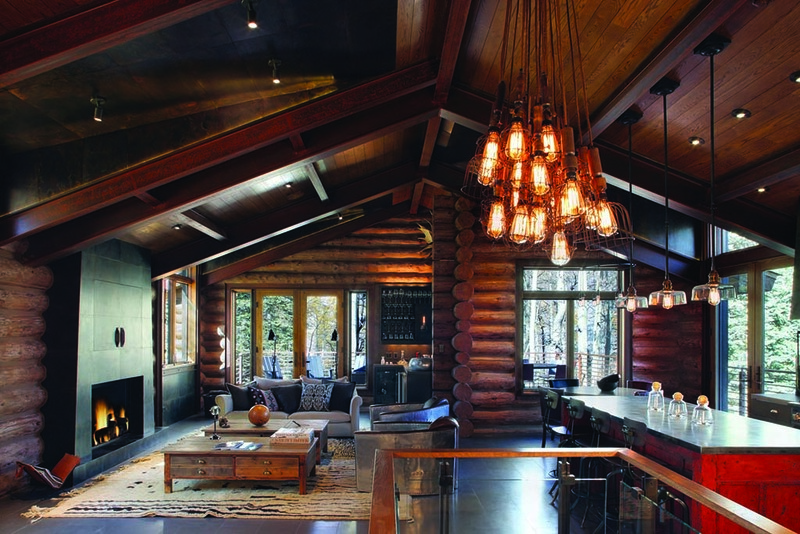 The two also worked well together on the cabin remodel, which was focused on maintaining the character and integrity of the log home while infusing it with a modern, livable look. “We wanted to design a house that was like a watch with hands on it — not a digital watch,” says Trujillo. The project involved adding on a huge wraparound deck on the exterior and building on an entire second floor with a master suite. This brought the original 2,500-square-foot house to 3,200 square feet. It is one of this remodel’s defining features. TruLinea designed a unique, contemporary log home with an abundance of glass. The cabin also taps into urbanity with weathered steel interior accents, slate floors, steel beams across all the trusses and a large, steel kitchen commissioned from Aspen. With the idea of creating a modern family-friendly space, the cabin’s interior was also opened up with a loft- like design. “It’s big and open and airy — and it’s everything you don’t expect from the outside,” Moody says. “We love that the locals and the visitors all get along there. It’s not about ‘What do you do?’ It’s about ‘What did you do today?’” Photos by Nico Marques. The Moody family also tapped into Telluride-based Studio Frank for their vacation home’s luxe and modern interior design. As the Moodys have spent more and more time in Telluride — they now vacation there at least two months throughout the year with their two teenage children — they found they needed additional garage space on the home, which originally had a one-car garage. True to form, TruLinea is currently planning a notably unique two-car addition that will be accessed from the home via a tunnel. “We wanted to fit some motorcycles plus we have ATVs and a couple of cars — we just decided we needed the space,” Moody says. “Every person that I bring there opens the door, and they say ‘Whoa!’ The best feature is the unexpected,” Moody says. Photos by Nico Marques. Since the new structure had to be placed away from the house but the Moodys wanted it accessible in all types of weather, they decided to employ a tunnel to connect the two. Two bedrooms will also be built on top of the tunnel. This new addition will bring the home to approximately 5,000 square feet. Spending a weekend in Telluride this summer? Click here for our ideal itinerary.